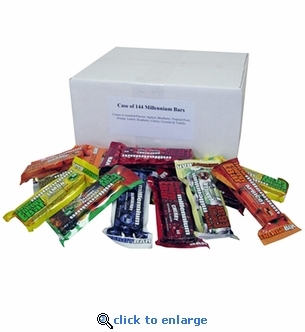 This Case of 144 Assorted Millennium Energy Bars has a 5-year shelf life and is a great solution for emergency preparedness at home, school and work place. Includes 144 individually wrapped 400 calorie energy bars that are U.S. Coast Guard approved and have a 5-year shelf life. Be prepared for the unexpected when a large group needs to shelter in place.